I’ve been coming to New York City in the spring for almost 20 years, usually to attend and often to give a workshop or two at a conference for student journalists. I’ve had some of best experience with students here, as well as some of my worst—losing a student on the subway or having one run off on her own to meet someone she only know from the internet. My family has traveled with me at different times and my children have mostly fond memories of Broadway shows and subways. But this year I came alone. Traveling alone brings temptations of its own. No, not those temptations. I’m talking about cheese Danish and Cuban sandwiches. And being alone is a good thing sometimes; there is certainly no place more lonely than a city where you hardly know anyone. But for the most part I enjoy being in the city. Getting in and out of the city, not so much. When I arrived Sunday morning about 7:30 I didn’t have the confirmation number for my shuttle from the airport so I had to pay for a ride. Sunday night on Time Square. It was a little unnerving when the driver read my credit card number out loud to his dispatcher, including the security code, in a van full of strangers. And tomorrow the shuttle service says it will take almost 3 hours to get to the airport during rush hour—and I have to speak until one and catch a plane by four. I’ll just take a cab. But while I’m in the city I enjoy walking around, looking at things I seldom see and thinking about things I don’t understand. 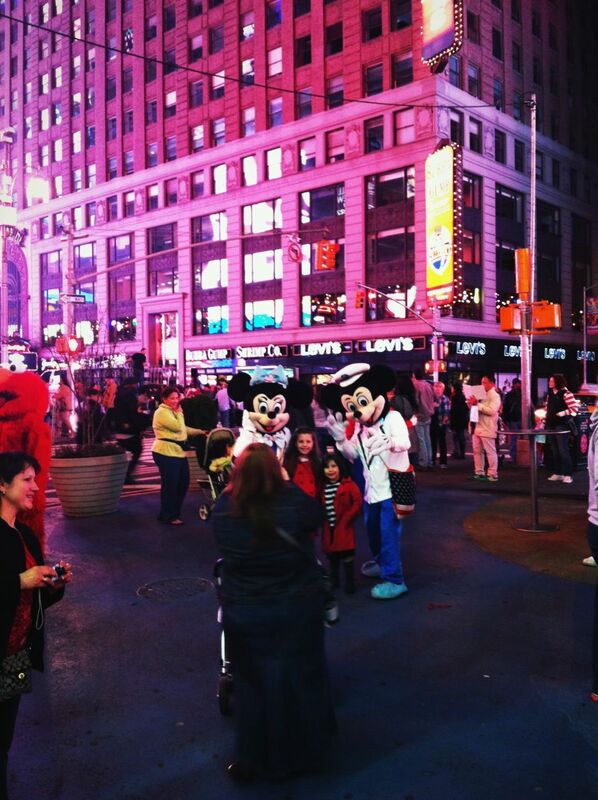 Sunday night on Time Square was a kaleidoscope of sounds and smells. And color of course. It was a beautiful spring evening, and the streets were packed with tourists and vendors. I’m convinced that if Muslims ever take over America, it will be because we finally succumbed to the smell of grilled Middle Eastern foods on Time Square. 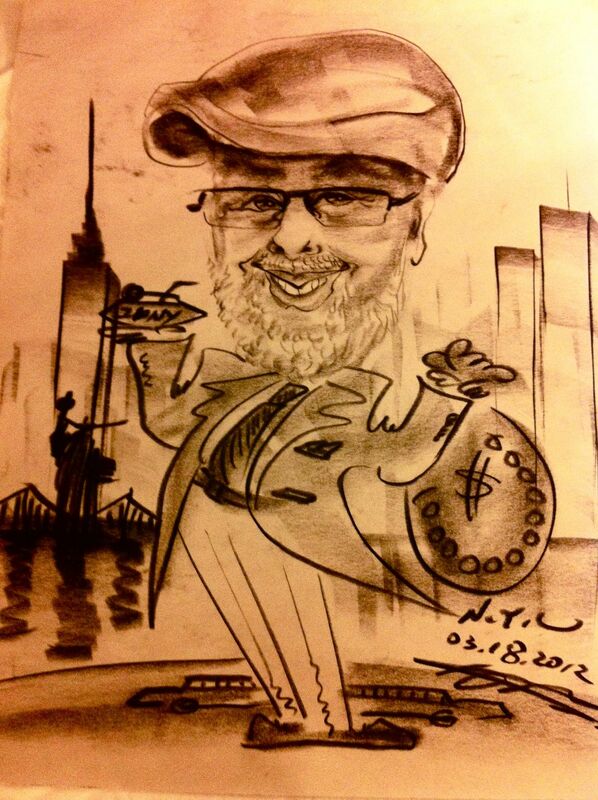 I had a cartoon drawn by a Chinese street artist. He drew me with a martini in one hand (I don’t drink) and a bag of money in the other. I was wearing an army style jacket but he drew me in a coat and tie. Is this his understanding of the American dream? Or did he see something in me I don’t see in myself? Should I go home to fast and pray? Was there something in my eyes or in my heart? I don’t think so. I went back to the hotel and worked on a new Bible dictionary for kids that will be published this fall. Not very many zeros in that check. Teaching is not actually a way to get rich either, and I’ve been doing it for 35 years. This morning I had no sessions, or at least none where I was presenting, so I took a walk from the hotel to Central Park and back down to Time Square along Broadway before working on the dictionary some more. 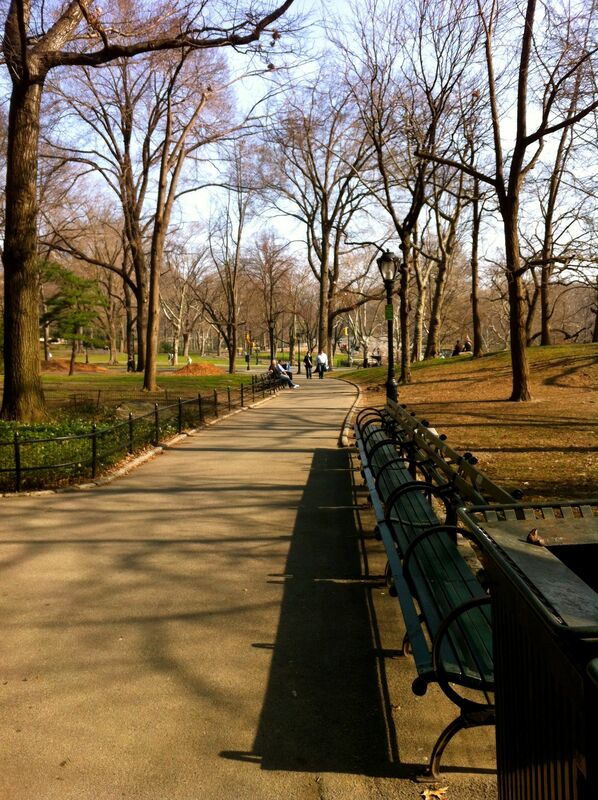 It was a gorgeous day and my only regret is that I didn’t walk through the park, but was diverted by the Apple store on 5th Avenue, the ruling master of American retail. • Broadway is a lot more interesting above 58th than down toward Time Square, where it becomes mostly banks and souvenir shops before until you get to the theater district. • The naked cowboy is no longer interesting. 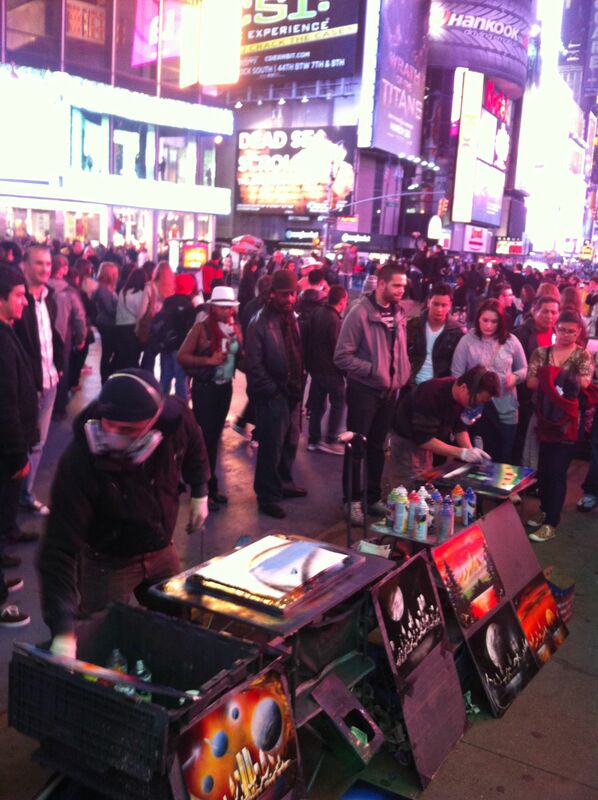 Spray paint artists (see video) are the current hot item, with large crowds gathering to see their work. • There are healthier food choices than when I first started coming, with lots of salad shops and fresher foods in the delis. • You can’t really rent a bike for $5, no matter what the signs say. You can’t do anything for $5. Tonight I had dinner with Kim Howard, who grew up in our church and now does research for the school system here in the city. It’s a long way from Jonesville. We talked about her future. Mine is simpler and probably much shorter. I’ll lecture tomorrow morning on writing as vocation and covering religion as a reporter. Then I’ll go home and sit on the porch drinking tea with Katie, watching the deer in the field across the road, defining “enmity” for six-year olds. I’m up to the E’s. And still learning to be content. Enjoyed going to New York with you. Perhaps I could translate your dictionary to spanish and use it with adults ( : All kissing aside, The english one could be used in our English classes.